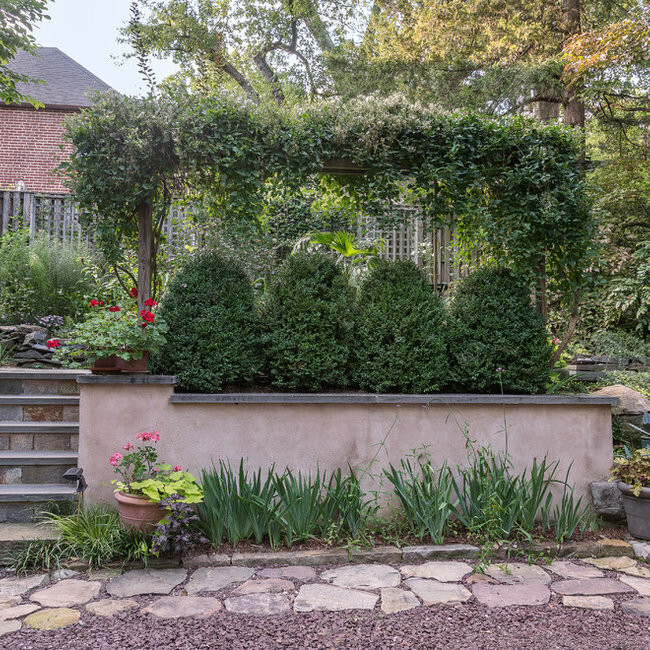 Cathy Carr, APLD, of GreenHeart, LLC designed this walled garden. Gilday Renovations was refurbishing the inside of the house and introduced Cathy to the new homeowners. They wanted to remove a swimming pool and a monolithic brick patio that took up the entire back yard. New Select Blue thermal 2'x2' squarel PA flagstones were used to create the paving for three outdoor rooms, with oversized flagstone steppers connect them. The large living room space, which features an Allison Armour Aqualens that can be seen from the sun room, is ample for large groups. A dining space for 10 and an intimate seating area were created to offer a variety of experiences in a relatively small site. A wide range of shrubs, perennials, and small trees color the space in four seasons. Great American Landscapes installed hardscape and plantings, and Outdoor Illuminations installed the irrigation and lighting. The screened pavilion, at the end of a narrow suburban property, provides both a bug-free destination and a spot from which to look back at the main house. 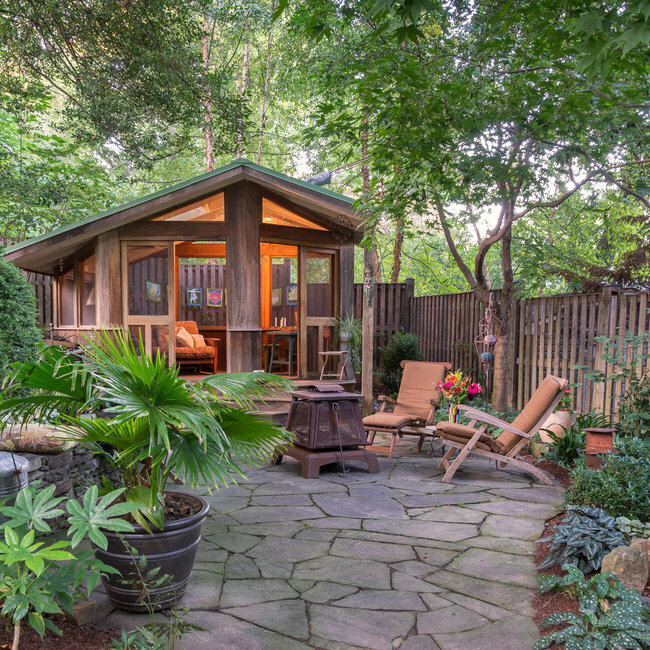 Made with Mahogany walls, Ipe flooring, a standing seam metal roof, and containing a ceiling fan and futon, it is a wonderfully private garden spot. 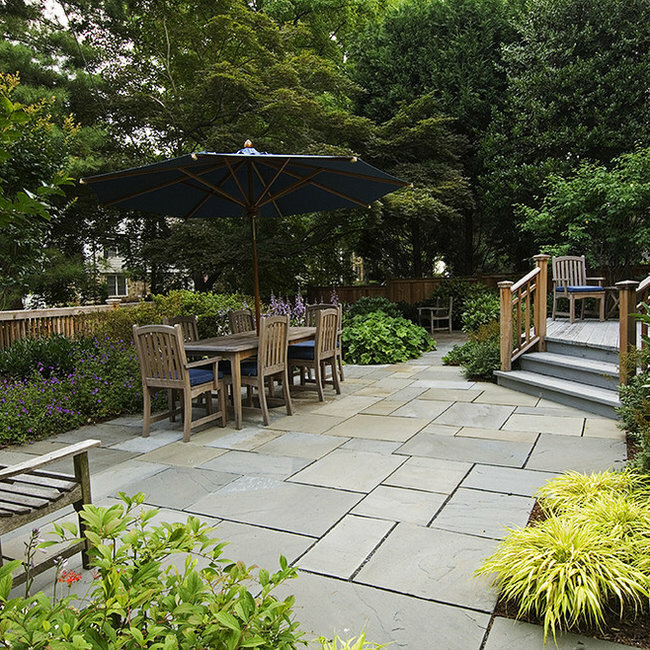 A curved stone wall retains the hill on the left and irregular flagstone is used to create the patio and path. Boulder steps lead up from the auto court. This elegant, semi-detached town home in Massachusetts Avenue Heights needed a makeover. The homeowners love blowsy English country garden plants and classic garden colors. 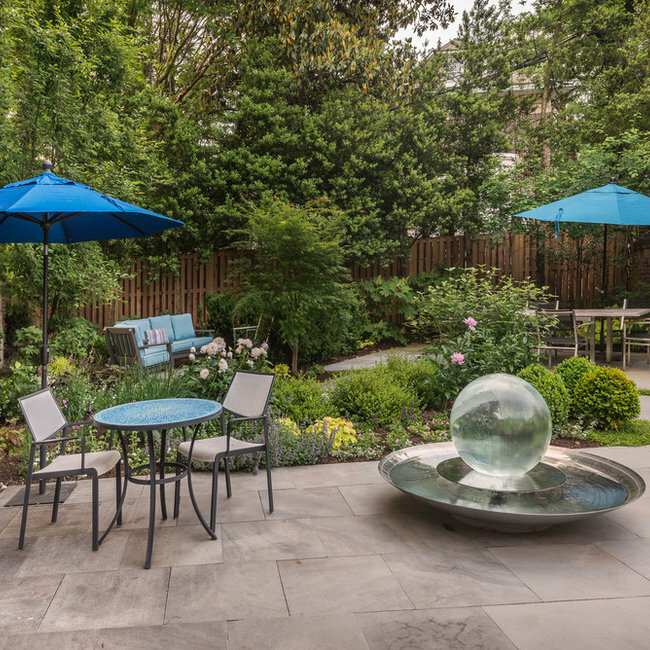 GreenHeart helped them with an overall plan that transformed the ho-hum space to a beautiful pleasure garden. Our design greatly increased their sense of privacy and enhanced the value of their home. 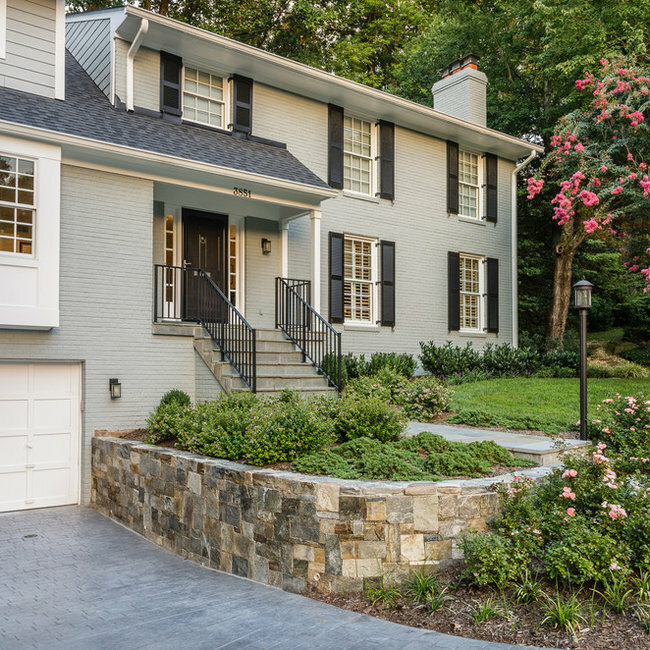 Cathy Carr of GreenHeart, LLC designed the landscape for this attractive Chevy Chase, MD home. The front entrance was opened up by transplanting existing boxwoods from either side of the walkway leading up to the front door door to a new location at the top of the hill. 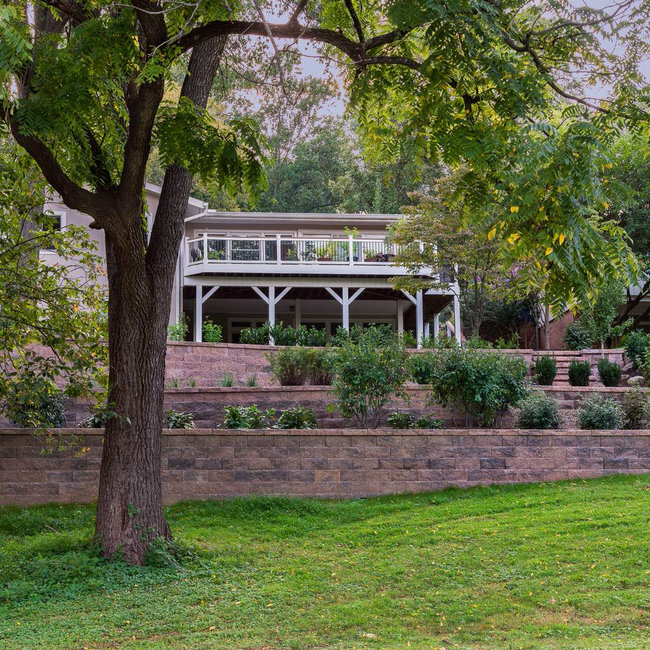 The lower area's Linden tree canopy made it too shady for turf to grow, anyway, so the lower lawn was replaced with beautiful flowering shade-loving perennials. New flagstone walkways were built straight to the front door, and to lead towards the backyard. 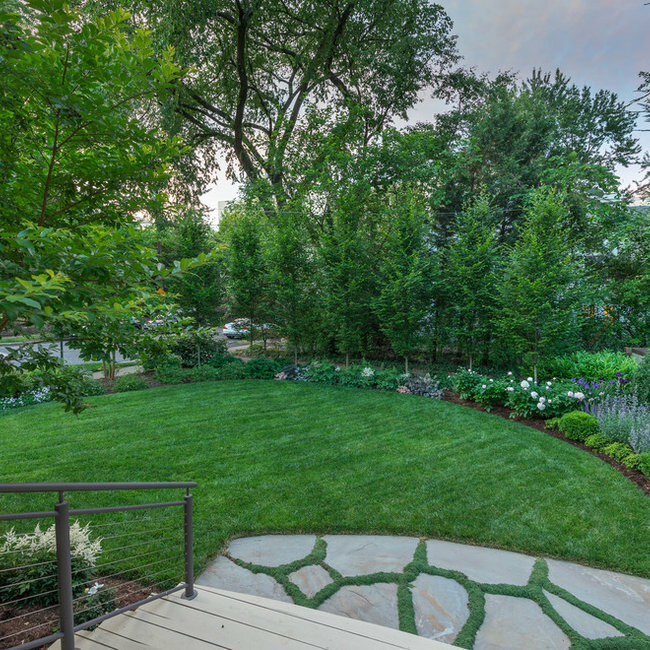 This stylish and comfortable residential garden was originally designed for a large family more than 25 years ago by Garden Gate Landscaping's Jim Sines. 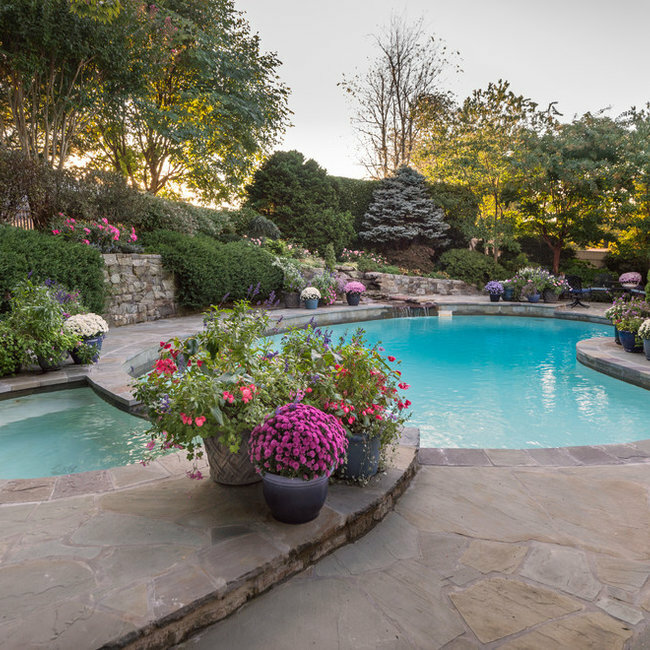 Still maintained in part by GGL and in part by James Sines, Jim's son, GreenHeart LLC has recently consulted with the homeowner to freshen plantings that contribute to the lush, romantic appearance of the garden. The aesthetic-minded designer wants high quality wood but the educated consumer wants sustainable products that are also low maintenance. I chose Zuri for the decking because of its unique combination of beauty, sustainability, and durability. Each PVC board is printed with an image of real wood grain (Walnut was selected here) then covered with an extremely hard plastic coating. 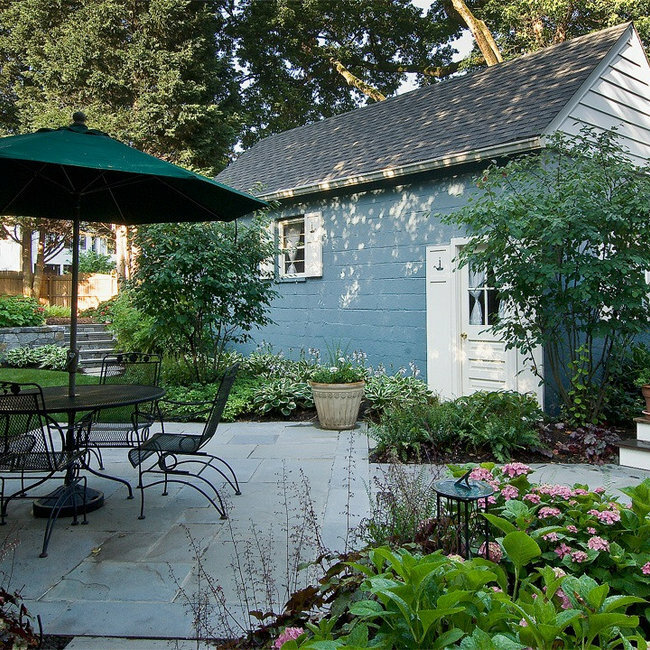 GreenHeart, LLC's Cathy Carr designed this project for homeowners who had downsized and needed to make to the backyard slope of this home useable for gardening. One homeowner loves to grow food, and mostly native perennials. We decided that a trio of three foot tall walls would allow for more ornamental plants to be grown. We also decided to give the walls undulating curves for beauty and interest. It was a large project requiring lots of time and heavy equipment. A concrete block wall was selected to complement the contemporary home and keep the investment reasonable. Steps and paths allow for easy watering, maintenance, and the enjoyment of strolling through the garden. The front driveway was expanded with flagstone to make the door easier to see and access. The same material is used to form a small patio underneath the beautiful existing Japanese maple. Low-voltage, dark sky, LED lighting was installed to extend the garden's use into the evening hours. Great American Landscapes installed the walls, paving, and large plantings, and Olson Weaver Lighting designed and installed the outdoor lighting. The homeowners are having fun developing the remainder of the gardens. The home is small and the family likes to entertain; I was asked to provide as much outdoor living space as possible. The back corner became a private spot in which to chat and listen to the water fountain. The sunroom opens to a deck close to the outdoor dining space. A grill is located near the kitchen door in the far right property corner. Crepe myrtles minimize overhead wires. 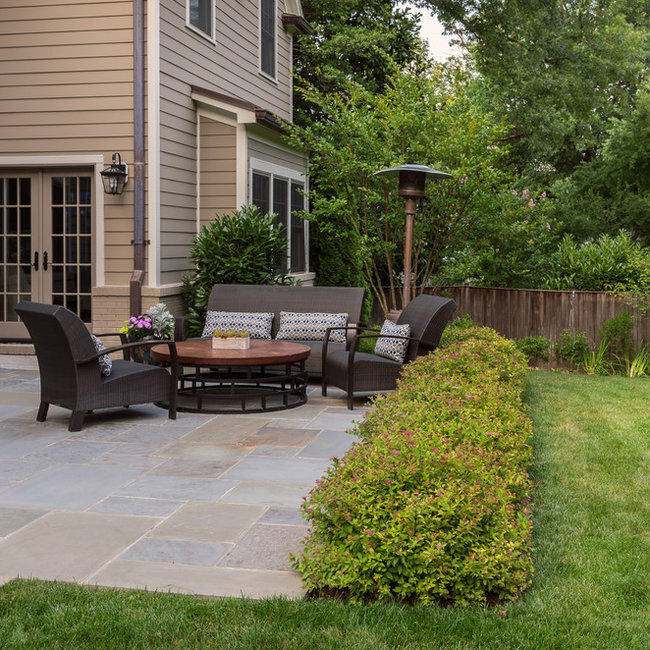 A private yard that feels intimate can still handle larger gatherings. 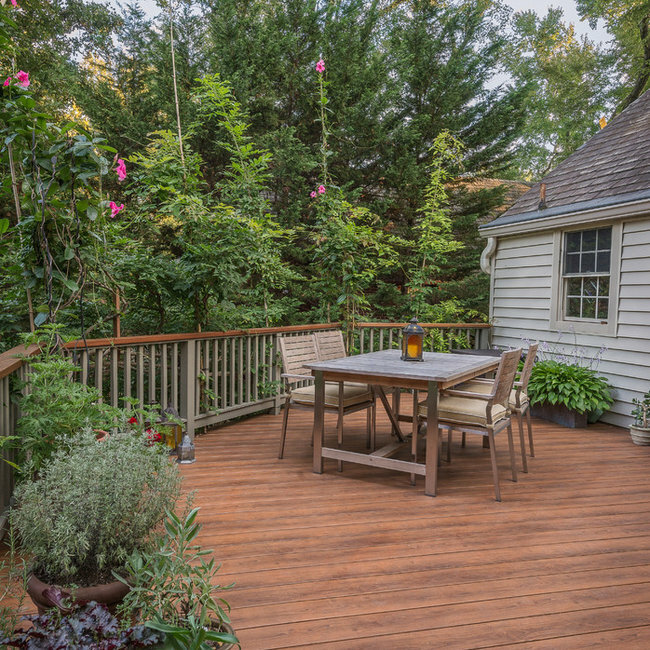 A house addition required rebuilding the back patio and garden for these homeowners. GreenHeart designed a new shade garden for the path to the back yard and transplanted as many mature plantings as we could. A more generous patio was constructed: colorful plantings alongside provide interest and separation from the large lawn, where kids can run around freely. Like many landscape renovations, GreenHeart Garden Designs was called in to improve the entry after the homeowners had Winn Design Build update the house with new windows and dormers. Driveway, walkway, and retaining wall were failing and the existing plantings were overgrown and uninspired. Great American Landscapes constructed a lovely new stone wall in neutral tones of grey and buff, and installed a more gracious walk, steps and easy-care plantings. We consolidated two separate steps into a simpler series of two steps, the risers of which became the termination point of the wall. Creative Concrete stamped and colored a driveway to complement the colors of house and the new stone wall. We kept the existing mature Crepe Myrtle and transplanted an existing Okame Cherry for respective summer and early spring flowering interest. Long-blooming drift roses produce soft, fragrant flowers all summer long and a dark evergreen fringe frames the front windows. Abelia will bloom in late summer along with Liriope. Homeowners had an ugly view of their narrow back yard. The garage is accessed from a back alley; it takes up some of the yard space. My design provided three new entertaining areas: a transitional deck just outside the sitting room door which is perfect for enjoying a cocktail; a grilling and dining terrace set on the diagonal to visually widen the space; a 'getaway' upper garden 'living room' from which to view the house. Lush plantings provide four season interest: color, fragrance and textures abound.